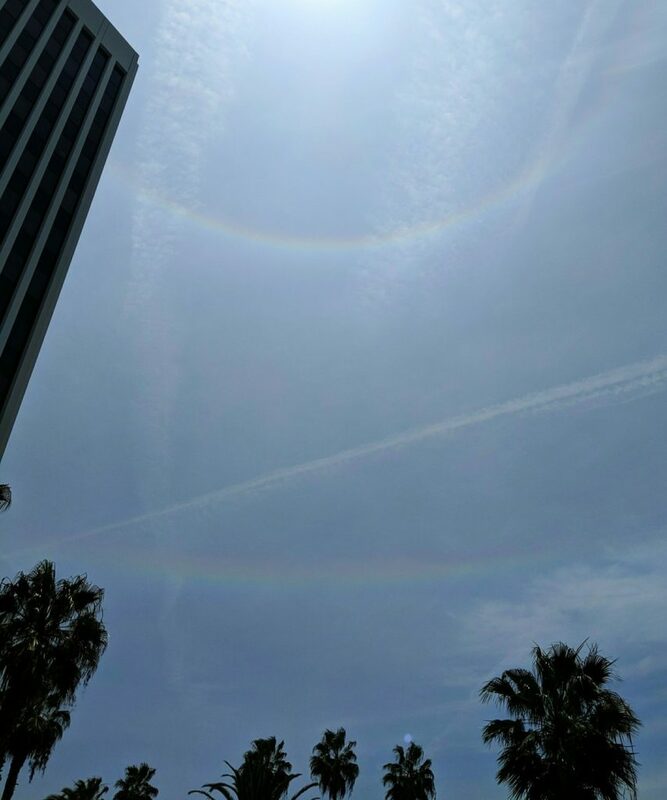 Two solar ice halos spotted at lunch today. The 22° halo around the sun is really bright and clear, and not that uncommon even in Los Angeles. I’ve seen so many that I still take photos, but I often forget to post them unless there’s something unusual about the view. The circumhorizon arc below it, on the other hand, I’ve only seen a few times, usually fragments. It’s faint, but it’s the longest and least wispy of these arcs that I’ve seen (though the best was probably this one from 2010). The lower one could be an infralateral arc. It wasn’t quite long enough to tell in person whether it curved upward or was parallel to the horizon, and it’s hard to tell how much of the curve in the photo is due to lens distortion. But according to Atmospheric Optics, they’re a lot rarer than circumhorizon arcs. It’s cool to be able to get pictures of these with my phone. There was a time I’d run to get a camera and hope it wouldn’t fade first. Saturation enhanced. It was really hazy! 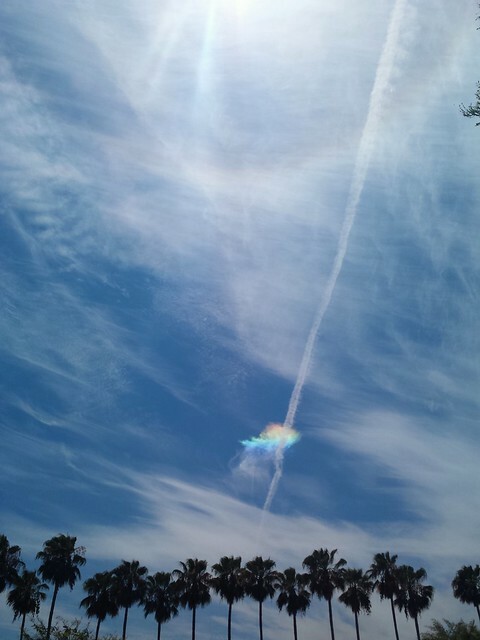 This entry was posted in Highlights, Photos and tagged circumhorizon arc, halo on May 8, 2018 by Kelson. I noticed the halo around the sun as soon as I walked out the door for lunch on Thursday. The rainbow cloud? That appeared as I walked past a building. I saw it as soon as the southern sky came into view again. The colors got more intense over the next few minutes, and I kept taking photos until my phone locked up. I stood there watching the colors intensify, then fade, while I pulled out the battery and waited for the phone to reboot. A man who’d been sitting nearby, buried in his phone, looked up wondering what I was taking pictures of. He’d never seen anything like it before, and wondered what it was, and fortunately I was able to answer. 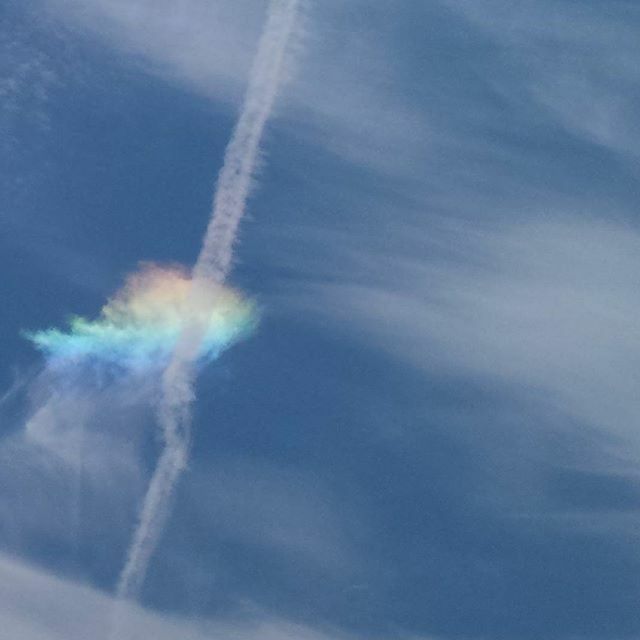 At the right angle, ice crystals in a cirrus cloud refract sunlight to produce a feathery rainbow effect. The circumhorizon arc runs parallel to the horizon, and while it can be long, it’s usually only seen in fragments like this. I’ve only seen a few of these myself, and it’s been years since I’ve seen one this intense. 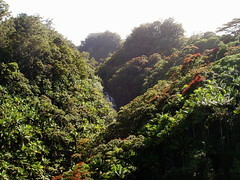 I took this photo through my polarized sunglasses, but the colors were bright even without them. When my phone froze, he offered to send me one of his pictures just in case mine hadn’t actually saved. Fortunately they had, and I actually posted to Flickr several hours before his message made it through the cell network. Within a few minutes, the cloud had drifted out of alignment, and the colors had faded completely. An hour later, on the way back from lunch, I noticed a longer patch in a smoother cloud layer, but it was faint enough that I could only barely see it with my sunglasses on. Without them, it faded completely into the glare. If I’d had my better camera with the zoom lens, I would have gotten some better shots of just the bright cloud. Then again, I wouldn’t have been carrying it with me to lunch, and the effect was gone in the time it would have taken to run back in and get it. So it’s probably just as well I stayed and watched instead. Funny thing: I posted a cropped view on on Instagram featuring just the arc fragment and contrail. When I went back to look at the #rainbowcloud tag last night, I found no less than SIX other photos of what was clearly the same cloud at various points in its five-minute lifetime! This entry was posted in Highlights, Photos and tagged circumhorizon arc, clouds, halo, rainbow, sky, sun on August 15, 2015 by Kelson. I saw this amazing circumhorizon arc around 1:30 this afternoon. I had just crossed the street while walking to lunch when I looked up, saw it…and walked back to the office to get my camera! The whole thing had vanished by 1:50, as the clouds drifted out of alignment, though I did see a more complete circular halo later on. They’re a lot less common than the 22-degree halos. I’ve seen and photographed a ton of those over just a few years, but this is maybe the second time I’ve seen something like this. Fourth if you count the two feathery fragments I’ve seen. *On the other hand, when I went back, I pointed it out to a couple of people at the office who are into photography, since it was visible through the windows on one side of the building. One of my co-workers has a digital SLR and carries it with him, so he went outside and got some great shots. If I hadn’t taken a late lunch and chosen to walk anyway and been in the habit of looking for halos and forgotten to bring my camera, chances are no one in the office would have seen it. Update (May 17): I just discovered that there are people who think these clouds are connected to earthquakes. No, they aren’t. They’re caused by ice crystals refracting sunlight, just like most halos, and have been seen in many places that didn’t have earthquakes. This entry was posted in Highlights, Photos and tagged circumhorizon arc, clouds, halo, rainbow, sky, sun on May 14, 2010 by Kelson. 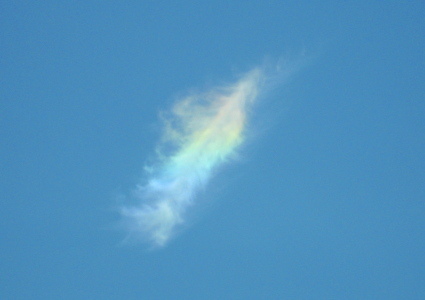 On my way back to work after lunch today, I looked out the window and saw this feathery wisp of cloud with a clear rainbow pattern running from red at the the top to violet in the middle, then turning plain white below. As I drove south, the colors moved down the cloud, disappearing entirely by the time I got back. By the time I could safely snap a photo, it was already more or less midway down the cloud. Look for a circumhorizon arc near to noon near to the summer solstice when the sun is very high in the sky (higher than 58°). It lies well below the sun — twice as far from it (two hand spans) as the 22º halo. The arc is a very large halo and is close to, and parallel to the horizon. Usually only fragments are visible where there happen to be cirrus clouds. We’re still 2 months from the summer solstice, but it was 12:38 PM DST (half an hour before true noon), and the sun was apparently near 70.6° high. 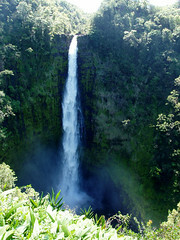 (The site is aimed at UK visitors, after all.) It also looked too far away from the sun to be part of the 22º halo, plus of course the colors were more well-defined. This also points out the should-be-obvious fact that ice crystals can still form in the upper atmosphere even when it’s warm — say, 90°F — on the ground, so there’s no need to limit halo-hunting to winter. I recommend checking out Atmospheric Optics’ additional pictures of circumhorizon arcs, most of which are more complete than this one. Some of them quite spectacular and must have been really impressive to see live. Update: I spotted and photographed a much larger and more solid arc in May 2010. 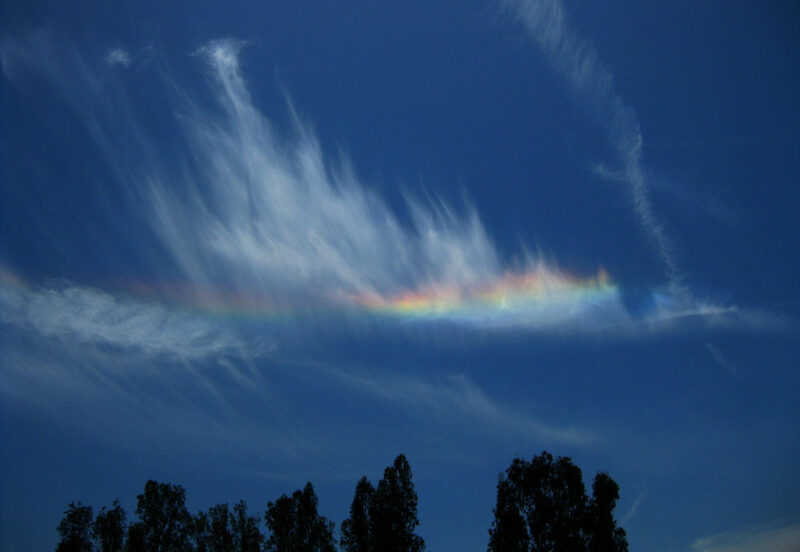 This entry was posted in Highlights, Photos and tagged circumhorizon arc, clouds, halo, sky on April 28, 2008 by Kelson.